Larry Hammond is the most senior member of the Firm Osborn Maledon, and the Firm’s investigations and criminal defense group. Larry’s practice, for many years, has focused primarily on criminal defense – both white collar and general criminal representation. He has also been extensively involved in complex civil litigation. Larry came to the predecessor of this Firm in 1974, after clerkships on the United States Court of Appeals for the District of Columbia, two Supreme Court Clerkships (for Justice Hugo L. Black and Lewis F. Powell, Jr.), and after serving as Assistant Watergate Special Prosecutor. Shortly after his arrival in Arizona, however, he left and spent the next four years as the First Deputy Assistant Attorney General in the Office of Legal Counsel at the Department of Justice. At the end of the Carter Administration, he returned to Osborn Maledon and has remained here since. Larry is often known best for his work in very high profile criminal cases, including his extensive work on behalf of the indigent defense community. He is a founder of the Arizona Justice Project, serving as its President for the last 20 years. He also helped found the Arizona Capital Representation Project to assist inmates charged or convicted of capital crimes, and has served as the Chair of the State Bar’s Indigent Defense Task Force since its creation 20 years ago. He also served as President of the American Judicature Society – an organization devoted to improving the administration of justice in America. Over his career, Larry has tried many cases – both civil and criminal. 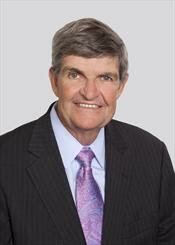 He was inducted into the American College of Trial Lawyers in 2013. In that same year, he received the highest career litigation award given by the American Bar Association. When asked about other awards he has received, Larry has often said that he takes the greatest pleasure from his receipt in 1980 of the Department of Justice’s Exceptional Service Award – the highest award given by the Justice Department – an award presented to him by then Attorney General Benjamin J. Civiletti. Larry takes special pleasure in working with the extraordinary team of lawyers and professionals in Osborn Maledon’s investigation and criminal defense practice, and is actively engaged in the work of the Arizona Justice Project.